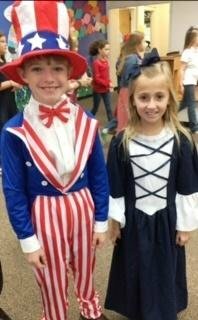 (Pictured) Uncle Sam, Wes Brock, and Betsy Ross, Miller Anne Pryor, greeted guests at the Veterans Day program. November 8th marked an extremely dignified and patriotic day on the campus of Southland Academy. The Melvin T. Kinslow Gymnasium was filled with students, faculty, parents, and our special guests, United States veterans and their families. With patriotism and respect as the focus of the celebration, the Lower School students offered a heartfelt program. The dignity with the presentation of the flags, the reverence of America’s White Table, the captivating drum line, and the echoing of the esteemed TAPS, along with student speeches and singing, the Veterans Day program captured the attention and emotions of everyone present. With earnest regard to God and country, Mr. William (Bill) S. Harris, Sr., Navy, grandfather to Laura Cate Harris (5th grade) offered the closing prayer. With high esteem and respect, Southland was pleased to have Herschel A. Smith, III, Commander USN Retired, as the featured speaker. Commander Smith delivered an inspiring message not only to the veterans but to the students as well. While reminiscent of his active military experiences, he praised all veterans for their service and commitment. Southland Academy is most humbled to pay tribute to America’s heroes, our veterans of the United States of America.